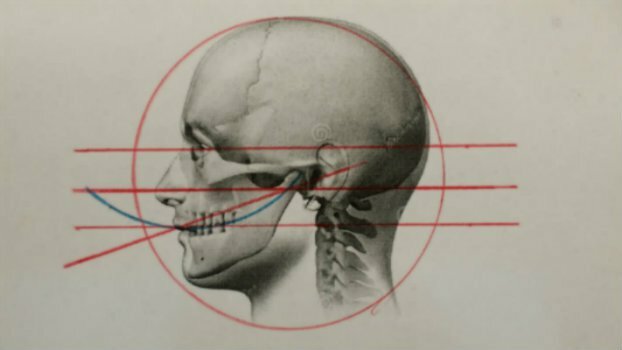 A Denturists role to make a successful set of dentures for specific individuals is to understand the function of the head, neck, Temporal mandibular joint (TMJ) and the insertion and influence if the facial and oral muscles. Dentures replace natural teeth, but do not replace the root function of natural teeth. Therefore dentures sit against the oral tissues of the Alveolar ridge left after the extractions of the teeth. Stability and the ability to control the dentures is through the balance of the occlusion of the denture teeth and the contouring of the denture base flanges that engage the muscles of the mouth. When you open your mouth to a large opening with natural teeth, it feels like your just opening your mouth. When this is done with dentures the lower denture rises off the ridge with the support of the muscles. Some simple steps to balancing the dentures is with the plane of your eyes, facial symmetry. Contouring the dentures is to utilize the ridge structures and tongue size to fabricate the dentures to the optimum size without interference of the tongue mobility which can push the dentures free of their foundation. Denturists use measurements to determine the functional freeway space between our teeth for proper phonetics of speech while providing the soft esthetic smile that best suits that specific individual. An Immediate Denture is a dental prosthesis constructed to replace extracted teeth and associated structures of the upper and/or lower arch which is inserted immediately following removal of the teeth. Since the time and the severity of the healing time vary from client to client, temporary tissue conditioning relines are done to provide fit and comfort. Once the tissue has completely healed, which may take anywhere from six months to one year, then a permanent reline can be done. Your new dentures are made with high quality acrylic and need to be maintained regularly. In time, your dentures will lose the smooth and shiny finish due to scrubbing them with a denture brush or by the very nature of the food we eat. Once this smooth surface is gone, stains and plaque and will be harder to remove. You should return to your denturist to have your dentures polished approximately every six months. Replace your dentures every 5-6 year depending on the amount of wear on the teeth and the shrinkage of your gums. Dental implants are a great solution for single tooth replacement all the way to full upper or lower replacement. The first step is the placement of titanium implant to replace the root. These will eventually fuse to the bone giving a sturdy foundation to secure the posts on your new teeth. This creates a painless new root to affix a lovely new set of teeth. Book a meeting with Steve, our Certified Denturist, to see if Dental Implants are a good fit for you. Not all denture teeth are created equally. Ivoclar Vivident removeable dentures offer the most life like options available and are crafted using the most advanced material science to ensure an enhanced appearance and dependable wear for years to come. Ivoclar Vivident denture teeth are designed to look like natural teeth with gender specific tooth shapes and colors that complement the age and personality of the patient. Are High Tech Dentures worth the extra investment? If your previous denture has broken, it is not because it was not made properly, but likely because the acrylic resin used to make dentures is fragile. It can easily break from dropping or from the wear of chewing. The Fibreforce Denture is the high tech solution for full dentures available at our clinic. The Alberta Dental Services Corporation provides an income- based benefit for qualifying seniors. This includes basic cleanings, checkups, fillings, root canals and basic dentures and their maintenance. The Dental Assistance for seniors program provides basic dental coverage to a maximum of $5000 every five years from the date of your first paid dental procedure. Be sure to confirm the amount that you will qualify for with the benefits provider, based on your income verification. The process to fabricating dentures requires 4 appointments, including the complimentary initial consultation. The 1 st appointment is for taking impressions of your mouth; the 2 nd is for more complex impressions and measurements; the 3 rd is to have a Wax Try In of the denture for verification fitting with the 4 th appointment for insertion of your new denture/s. There will follow an appointment within 2 weeks to ensure the fit and function that you can expect of a customized denture. After , we will follow up with you in 6 months for continued support as well as annual check-ups. All of our dentures are made in house by a regulated denturist. All adjustments and repairs are done in-house by the denturist who originally met with you. You can be guaranteed of truly personalized care with no wait times for an outside laboratory to do this work. Your basic dentures will last about 5 years. Investing a little more in a stronger material can make your dentures last 7-10 years. Depending on your eating habits and of course the strength of your jaw muscles, these numbers can vary from person to person. It’s also very common for gums to shrink over time which causes dentures to become loose fitting. This is when we do a Reline. A reline is when we add material to the inside of the denture to improve the fit. This can be a temporary fix until a new set of dentures can be completed. A customized mouth guard is a great idea for anyone who is involved in any type of physical sport such as hockey or lacrosse. This is especially important for younger players that need to protect their tender teeth against any permanent or costly damage. A custom fitting mouth guard will be more comfortable and easier to wear. We offer an affordable customized option and you might even be able to get them made in your own team colors!